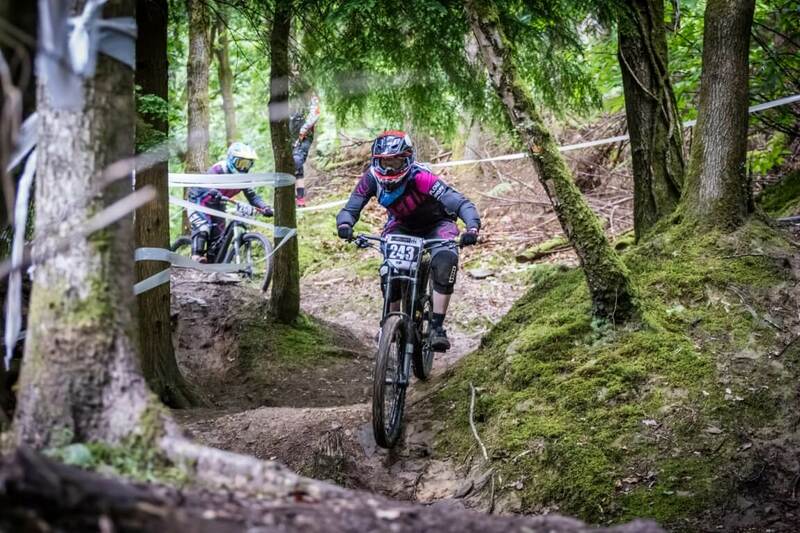 Round 2 of the MIJ summer series was held at the Forest of Dean on Sunday 25th June. After missing the first round due to injury it was great to see Kate back joining up with the girls for round 2. Here’s Kate’s race report. Pushing up the fire road with the sun belting down was a vast difference to the last time I was racing the Sheepskull track at the Forest of Dean, mud and ice like roots is all I can remember from the last time I raced on this track. With the forecast looking good for the weekend sun cream took the place of my water proofs, happy days! I’d missed the first round of the MIJ Summer Series through injury so it was great to be joining up with the girls for the second round and what a belter of a track Sheepskull is. The top section is quite flat with tricky switching turns, these turns feel best for me when I’m not going at them too fast as there’s a few quite tight ones. Nice, steady and smooth seems to be the way. When you get it right you can certainly feel it! You then drop into a bomb hole that really gets your speed up ready for the mass of roots lying ahead. These roots are lethal in the wet; I took a very high safe line last time I raced here, this time I was aiming to hit straight through the middle with as much speed as I could. You’re then spat down a chute over the fire road and into the next steep fast section. It’s all about trying to keep off the brakes here; with roots, stumps and rocks this can prove testing. For the last part of the track you enter a bomb hole and the quickest line through here is straight through the middle watching out for the tree stump at the foot of the drop. You’re then entertained with a series of jumps and berms as you head to the finish line. I met up with my new team mate the mini shredder Elin for the first time and what a little ripper she is! We spent time looking at lines and taking runs down the track, practice was going well but we were soon greeted with dark clouds and a pretty heavy shower over the forest. I had one more practice run with Elin and I was pleased to still hit the roots through the thick of it straight down the middle; I’d have shied away in the past, but not this time. Getting slightly big headed about this I decided to have a nice off on the next section catching roots with my ankle and giving my shin a good bashing, it took me a while to peel myself off the floor. Ouch – I’m sporting a rather large ankle with bruises galore as I’m typing. I was a bit disappointed to have an ‘off’ on my last practice run but hey ho off we went for our race runs! There was the usual buzz at the start line with all the girls gathered together as we started to line up for our race runs. Elin preferred to start near the back of the pack for her first race run so we high fived and wished each luck and I took my place. Still having my ‘off’ on my mind I set off on my race run and it was rather messy! The top flat twisty section got me on the brakes a few times so I lost my flow but I hit the roots nicely down onto the fire road so I was really chuffed at that. I was still a bit messy through the rest of the track but coming into the last section hearing the cheering of the onlookers and the girls waiting at the finish line is the best feeling! I came in at 2:05, not great but alright for a messy run. Now it was time for me to wait for Elin to come down the track! We certainly heard her coming – the spectators made a right racket for her which was great and she was certainly powering home over the last jump with a fantastic time. My second run was a lot smoother. With my legs feeling heavy I still managed to improve my time by 3 seconds to 2:02, which was great in a really tight field. I feel like I’m heading in the right direction after only starting racing last December, I can only thank the people I have met along the way and my sponsors Flow.